I have been designing and making stained glass professionally for over thirty years. My passion for this medium has never waned and in fact I eagerly embrace new techniques to keep my work fresh. Working to a clients brief is my forte. Listening to my customers wishes, meeting on site and sharing my knowledge, ideas and enthusiasm for the craft ensures that the stained glass windows I make are exceptional. To work with recent planning laws I have overcome the restraints put on large installations of single glazed stained glass. I can supply my customers with triple glazed solutions in art glass where the stained glass is encapsulated within a sealed unit. These cannot be guaranteed and purists may feel this lessens the aesthetics of stained glass. However, I am very happy to offer this wonderful solution to allow my clients to have beautiful stained glass that complies with new planning laws and saves energy. I am a long standing member of British Society of Master Glass Painters, The Contemporary Glass Society and I occasionally exhibit as part of Surrey Artists Open Studios. My workshop has inspiring views over the valley at Abinger Hammer and this supplies endless inspiration for my own work. Until I was 6 years old I lived near Boston in Lincolnshire. My father was an eminent entomologist and so (much to my mothers angst) many hours were spent with dad and older sister poking about on The Wash, an area of boggy marshland with a very quick tide, dykes and endless skies. My father pointed out flora and fauna and I was able to name the most unusual of creatures from a very early age. This enigmatic landscape was such an early inspiration, a special place to allow the mind to wander and dream and has left me with an enduring love of the sea and sky. My mother worked too but in her spare time she was very creative and as well as dress making she made beautiful ceramics. By the time I was born in 1961, she had already been making pots for many years. In 1975 after a few years in Cambridge, my family moved again to Kent, The Garden of England. Wye is a village some 12 miles from Canterbury and within the Conservation area of Kent. Here in my teens I continued my love of walking and began to identify with poetry, music and art. In this wonderful part of Kent I made lasting friendships and discovered some really great music and art. Now, while I am working on stained glass in my Surrey Hills studio, I listen to some old favourites like John Martyn, Nick Drake and James Taylor with a peppering of the new (and not so new!) Zero 7, Faithless and Gregory Porter. I love a bit of disco and dance music too. If I am need of some divine intervention and am a bit stuck with a particular design, then a good blast of Spem In Alium by Thomas Tallis jolts my muse back into action. In 1979 I left home and moved to Chatham, Medway, Kent to attend the art college there. This foundation course in art was supposed to narrow down my field of interest with a view to attending a further institution for a three year degree course. Unfortunately this did not happen! I was still sure I had not found my niche within the arts. A long search, through books and leaflets, (no Google to help in 1980) revealed a little known and very new course at Chelsea School of Art, London. This three year course was called Mural Design and Public Art and nearly every term allowed me to explore new mediums. It was here where I made my first stained glass panels. On leaving Chelsea I was very interested at first, to pursue a career working in set and stage design and was supremely lucky to be given the first job I applied for. Tom McPhillips is a world-renowned stage designer and my two years working with him in 1983-85 were such a brilliant experience. 1984 is along time ago but my time with Tom is still in sharp focus in my mind. He was such an inspirational man to work for. He is a perfectionist and so very talented. He taught me techniques and how to work effectively to a deadline. Although I did leave his employ after only 2 years I was, at the time, his longest serving assistant! We worked on backdrops and stages for bands such as Culture Club and Judas Priest. Tom moved to Lititz, PA in the late ‘80’s to found Atomic Design , I did go with him to work on one project but I wasn’t ready for such a change of scenery. Not long after this I gained employment at Goddard and Gibbs stained glass studios. Meaning to stay for 6 months then go travelling, I stayed for nearly 15 years! Goddard and Gibbs Studios was based in the East End of London. When I joined the team in 1986 I was, for a time, the only female in a workshop full of traditional craftsmen. Starting on the bench I had an informal apprenticeship. Taught by talented elders and younger craftsmen, I was given the traditional skills required for making stained glass and leaded lights. Time spent on the bench making acres of leaded lights for huge domes destined for the Middle East, was such a great way to learn the basics of my craft. After 10 years working my way around the workshop and with the design team I had gained knowledge of every aspect of stained glass. My initials are painted in a large heraldic stained glass window in The Henry VII Chapel in Westminster Abbey for my part in project managing and making these windows. Her Majesty The Queen dedicated the window in October 1995. As one of the few females within what was a very traditionally male environment, I attracted the attention of a TV producer and took part in a short film called Capital Woman, which put the spotlight on me and my chosen career. In 1999 I was project manager for the manufacture of stained glass windows designed by Graham Jones for The Church of The Latter day Saints. 14 new temples were built worldwide and I visited the installation of one set in Halifax, Nova Scotia. Following my very successful career with Goddard and Gibbs, I felt it was time to focus on my young family and leave behind the hours of daily commute to London. Since setting up Abinger Stained Glass I have been growing both sides of my stained glass business. 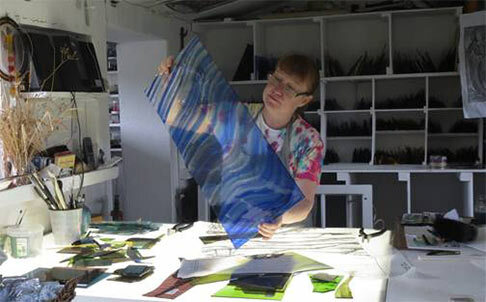 My stained glass courses and fused glass courses are so popular and book up months in advance and my commission order book has always got a very interesting array of projects on the design board and on the bench. 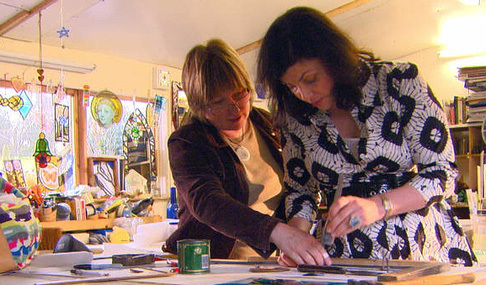 In 2009 and again in 2010 Kirstie Allsopp filmed with me for her series, Kirstie’s Homemade Home. I have made windows for some prestigious people and places including a series of encapsulated stained glass windows for Ringo Starr and a set of windows for The Crypt in Her Majesty’s Royal Palace and Fortress of the Tower of London. I send work all over the UK and into Europe. In 2013 I was a finalist in Surrey Artists of The Year. I have been featured in many publications including Surrey Life, Country Life, Craft & Design Magazine and the local Surrey newspapers. Error: Error validating access token: Session has expired on Monday, 08-Apr-19 03:56:55 PDT. The current time is Friday, 19-Apr-19 11:27:30 PDT.